Here at Hi Tide Ocean Beach Resort we know what makes a vacation home right for our guests. We make it our business to maintain the highest standards that go above and beyond our guest's expectations. We provide the finest in vacation rentals to ensure that our guest's vacation is a success no matter which property they decide to stay in. Our Ocean Front Condominiums and excellent customer service set us apart from the rest. The 5-Star guest reviews that we receive (from independent websites) set us apart from other lodging on the Washington coast. Our Ocean front condominiums are situated on Moonstone Beach at the north end of Moclips, WA, affording spectacular views of the magnificent Washington coastline with rugged Point Grenville. The beautiful soft sandy beaches are just steps away. Every Condo unit offers stunning sunset views. 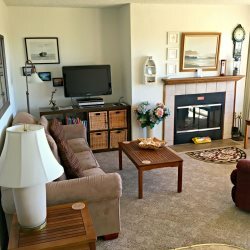 Hi-Tide Ocean Beach Resort is just steps away from the beach making it a truly outstanding Washington coastal lodging experience. The Moclips River borders the east of the property and along the north to the ocean. You can walk wooded paths to the river or along it's banks into the forest or out to the Pacific Ocean with it's uncrowded beaches. Even our physically disabled guests are sure to enjoy our ground level sunset view rooms. Don't just rent a room - come home to Hi-Tide - your home away from home!